The cast and director of “Amazing Grace” share the playwright’s spotlight. Left to right: Chuck Conlon, Tami Vaughan, James Kassees, Letherio Jones, Luke Valadie, and director Preston Boyd. Photo by Richard DiSammartino. The true story of an English slave trader whose life-changing experience inspired him to write the hymn “Amazing Grace” was the subject of the winning play in Theatre Odyssey’s Fifth Annual Student Ten-Minute Playwriting Festival. Written by Luke Valadie of Saint Stephens Episcopal School, “Amazing Grace” was one of eight plays by local high school students in the festival. Valadie received a $500 scholarship from Theatre Odyssey. The Festival was staged at the David S and Anne V Howard Studio Theatre on the Bradenton campus of the State College of Florida. The runner-up play, “Goodbye, Old Friend,” by Sarasota High School senior Richard Caldwell, earned its author a $300 scholarship prize. Caldwell’s play concerns two homeless army veterans. Scripts of the eight plays in the festival were evaluated by three respected adjudicators: Robert Gratzer, theatre teacher at Palmetto High School; L’Tanya Evans, head of Visual and Performing Arts at Out-of-Door Academy; and Marjorie Kammerlohr, theatre teacher at Riverview High School. The winning plays were announced following the final performance on January 15. 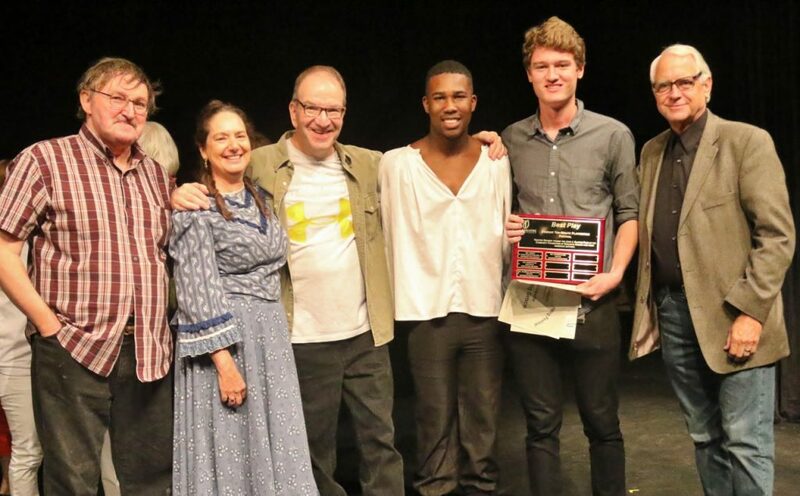 A plaque for Best Play, bearing the names of the current and previous winners, will be displayed at Saint Stephens Episcopal School through the year, until the next student playwriting festival which may take it to a different temporary home. The eight plays selected for production this year were among more than 30 received from area students. Other plays presented this year were: “The Lies in a Perfect Life” by Guinevere Pijor; “Tomorrow” by Pierce Carnell; “The Price of Friendship” by Demetrius Davis and Fred Billy; “The Scientist” by Kassandra Hackman; “Bergamot and Lavender” by Courtney Zoller; and “The Battle” by Emily D’Amico.